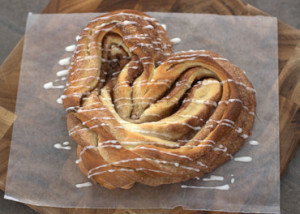 A beautiful, heart-shaped sweet loaf swirled with cinnamon. This recipe is featured at My Kitchen Addiction. In large pot over medium heat, melt butter. Add water and milk. Heat until 110°-115°F; remove from heat. Add sugar and eggs; stir in Yeast. Whisk until mixture is smooth. Add flour and salt. Stir with heavy wooden spoon. If necessary, work in a little additional flour with your hands until the dough is no longer sticky. Knead 2 - 3 minutes. Place dough in lightly oiled bowl and turn to grease top. Cover; let rise until dough tests ripe. Punch down, cover and let rest 10 minutes. Grease two baking sheets. Turn out onto a lightly floured surface. Divide into 2 portions. To shape, roll each half of dough into a 15 x 10-inch rectangle. Filling: Brush each half with half of the melted butter. Combine the ½ cup sugar and cinnamon. Sprinkle half of the sugar mixture over each dough rectangle. Roll up each rectangle, jelly-roll style, starting from one of the long sides. Pinch seams to seal. Place seam side up on prepared baking sheets. Fold half of each roll over the top of its other half, sealing ends. Starting 1½ -inch from the sealed end, cut all the way through the dough to the folded end. Turn cut sides out so they face up, forming a heart shape. Cover; let rise until indentation remains after touching. Preheat oven to 375°F. Bake 20 - 25 minutes or until lightly browned. Remove from baking sheet and cool on wire rack. In small bowl, combine icing sugar and milk. Drizzle Glaze on top of hearts.